Central will have a new contributor to its growing creative arts economy if Nelson Mandela Metropolitan University’s (NMMU) bold new plan for its Bird Street Campus is realised. Once the present Business School moves to its new premises at Second Avenue in Summerstrand in December, the inner city campus is destined to become a hub for the university’s arts and culture focused activities as part of the bigger Mandela Bay Development Agency initiative to develop a creative precinct in Central. 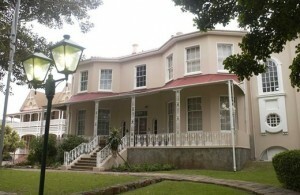 “Culture is at the centre of SA’s revitalization,” Prof Swartz told those who attended the function at the refurbished Athenaeum in Central, adding that he was grateful that a group of committed NMMU staff had convinced executive management not to follow the original business decision of selling the property. As a result, the Bird Street Campus will add “tremendous value” to the Mandela Bay Development Agency’s plan to regenerate the city’s Central area. According to a delighted Mary Duker, director of the university’s School of Music, Art and Design, research has shown that the presence of an engaged and active university school of the arts acts as a positive and stabilizing factor in inner city urban regeneration projects. “We know we can play a meaningful role in the metro. Our plans revolve around our intention to contribute to the building of a sustainable creative economy. We want to see our students remaining in the metro once they graduate, and in order to do that we need to see the creative arts footprint grow. ” said Ms Duker, who cited the regeneration success stories of Tyneside, Newcastle, and closer to home, of Woodstock in Cape Town and Braamfontein in Johannesburg. “This expansion into the inner city will make us much more accessible to so many more people,” said Ms Duker, who is already actively involved in various artistic developments with the MBDA in Central. “Its where town will meet gown. It’s a place where we’ll be able to offer exciting creative activities”. She said that when the university’s Centre for the Advancement of Non-Racialism and Democracy (CANRAD) staged an environmental film premier at the Bird Street Campus earlier this year there was a huge turnout – this had indicated the likelihood that open university lectures, workshops, exhibitions and dialogues in this very accessible centralized spot would be well received by the general public. The Music Department is looking forward to housing its newly-created Jazz Unit on the Bird Street Campus, and to re-establishing its conservatoire there. Years ago when the former University of Port Elizabeth offered music lessons to school children in Bird Street Central, they had up to 300 pupils. This number dissipated once the university moved out to Summerstrand. “This move will contribute significantly to making quality music tuition accessible to the wider community, we will have a new and very accessible performance venue, and new impetus will be given to the department’s jazz offerings,” according to Music Department head Prof Erik Albertyn. Bird Street Campus is home to several historical buildings. Fleming House, the old Marist Brother’s College Building, is being earmarked as the university gallery, while the double-storey building behind Felsted, is planned for multi-purpose usage, housing the music conservatory, jazz unit and the public lecture facility. Other buildings on the site will be transformed into fine art studios and into an innovation hub, the school having outgrown its present one on Second Avenue Campus. No definite plans have been made for the former SA Navy residence Felsted, but talk is revolving around upmarket postgraduate and/ or visiting scholar accommodation so that the Bird Street Campus also becomes a “space for living as well as learning”.